Google PageSpeed Insights is a popular tool many site admins use to optimize site load speed. One thing to keep in mind, however, is PageSpeed Insights does not measure speed directly: it measures how certain resources on the page load, then offers suggestions on how those resources might be sped up. This means a site with a low score could still have a great load speed and achieving a 100 is very difficult. We recommend testing other eCommerce websites you're familiar with in order to get an idea of how other websites score compared to your own. This article will take a look at each possible suggestion and detail the steps that you can take to follow them. PageSpeed Insights docks points for large images (by file size, not dimensions). This is typically where site admins can make the biggest impact on site load speed. Large image file sizes can significantly decrease performance, especially on pages with lots of images, like category pages. There's not a hard rule on how large a file size your images should be, however, in general under 100KB is recommended, and even smaller is better for performance. Solution: The solution is to optimize the images. Image optimization means compressing the file using special software that leaves image quality completely unchanged (lossless compression) or slightly affected (lossy compression), while significantly reducing file size. If you're not already familiar with this type of software, use your favorite search engine to search for "Image optimizers" or "bulk image optimizers" -- There's many free and paid tools to accomplish this task. Pro-Tip: To make this job easier, submit a support ticket to request SFTP Access (if you don't already have it) -- This will allow you to access your store's file system directly and bulk edit/move images and other files using an FTP Client. A file or resource is considered render-blocking if it prevents the visual stuff on a page from displaying while the file is being loaded. A browser loads pages sequentially, one at time. So, if a file is at the front of the line, but doesn't contribute to the display of the above-the-fold content (the first stuff on page before scrolling down), it is blocking the content from displaying by some fraction of a second. Even though render-blocking scripts only contribute small fractions of a second, many such resources can add up, which is why google recommends limiting the number of render-blocking resources. Note: It is only recommended to make these changes if you are knowledgeable in HTML and JS code. We also suggest testing the changes in a cloned copy of you're theme so you can see the changes in an inactive theme environment before altering the active version of your theme. Google recommends "[s]etting an expiry date or a maximum age in the HTTP headers for static resources" so that the browser will "load previously downloaded resources from local disk rather than over the network." Solution: Only the external server hosting the file can set the HTTP headers for that file. 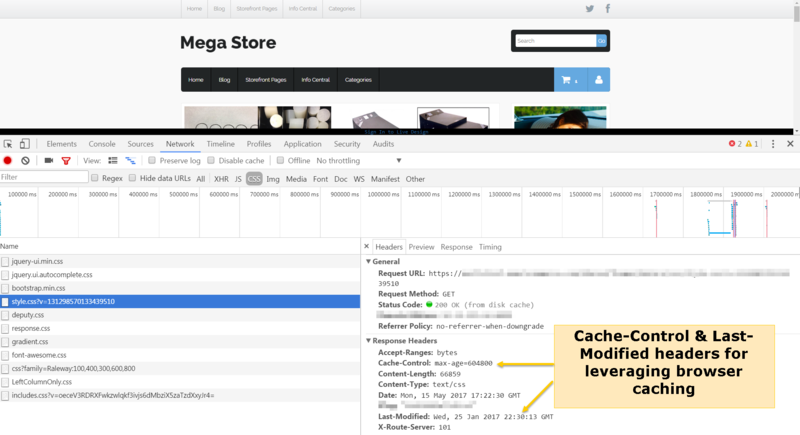 AmeriCommerce already sets the appropriate HTTP headers that leverage browser caching, so nothing needs to be done on your AmeriCommerce store to take advantage of this. Put simply, minifying is the act of removing all unnecessary spacing from source code file. Each space contributes to a larger file size; so, removing the spacing can decrease file size, which can lead to slightly faster load times. Solution: At the time of writing, AmeriCommerce does not have a built-in solution for automatically minifying source code files. This means, that site admins will need to minify files themselves, should they desire to do so. The downside to this is that, in order to be easily edited, the file will need to be unminifed each time changes need to be made, then reminified before saving. Note: Files located in /store/inc/ are not accessible for editing and can not be minified. Pro-Tip: There are online tools that will minify copied-and-pasted JS, HTML, and CSS. webpagetest.org: Shows the load time of specific files; can help identifiy which files are taking the longest to load. For example: can help identify large images they may need to be optimized. Themes > Edit Theme > Heads Tags: Tags here get added to the HTML <head> of every page. Many JS scripts and css file references are located here. Themes > Edit Theme > Theme Files: Easy way to see a theme's files.